On 12th May 1948, the Mirza Ali Khan alias Faqir of Ipi published and issued an anti-Pakistan poster from his headquarters, at Gurweik. In the poster he claimed that "Pakistan was a creation of the British and Muhammad Ali Jinnah was a British agent". He further declared that "he would start an operation against the Government of Pakistan". In June 1948 Faqir of Ipi pulled a lashkar together and attacked and then occupied Datta Khel Khassadar post in the Tochi valley. Pakistan air force was sent in to deal with the situation. Bombers went in destroy the villages of the participant Shabi Khel Mahsuds and to disperse the lashkar from its occupation of of the Khassadar post. "We the Tirah branch of of the National Assembly of Pakhtunistan having formed the first nucleus of a free and democratic Muslim government amidst the lofty mountains of Tirah, hereby express the hope that with the help of Almighty Allah and the support of the brave and freedom loving Pakhtuns , this young plant will in a short time grow into a sturdy and fruitful tree which will not only benefit Pakhtunistan (from Chitral to Balochistan and from the Khyber and Bolan to the banks of Indus) but will also fulfill its obligation towards the progress and peace of the world". In a broadcast from Radio Kabul , this proclamation was greeted with great enthusiasm in Afghanistan, which it's Government announced that it was extending immediate recognition and support. In the same month a jirga of the different tribes of Waziristan visited Kabul with the consent of the Faqir of Ipi. The jirga was assured by the Afghan authorities of all form of assistance. "From August 15, 1947, when the British appointed Mr. Jinnah as the Governor- General of Pakistan, the Pir of Manki, Pir of Zakori, Doctor Khan Sahib, Abdul Ghaffar Khan and other prominent figures amongst Pakhtuns raised their voice for the introduction of Shariat and freedom for Pakhtunistan. But against these demands, intending to bring Pakhtuns under slavery with the help of gold and bayonets, the so-called Islamic Government began to promote the religion of Mirza Ghulam Ahmad Qadiani and continued the enforcement of the British supremacy. The Pakhtuns are like one body and cannot be divided into two. Generosity and sense of honour is the heritage of Pakhtuns. They also have the sharpest sword in their possession. Despite 14 years of continued bombardment by the Britishers, the people of Waziristan did not accept slavery. Be courageous, like the Faqir of Ipi who did not flee from the battlefield during the past 14 years. However two are the major defects (i) the introduction of man-made laws, and (ii) encroachment upon the legal rights of Pakhtuns. According to the holy Quran Qital is permissible. One who dies in that way will be a Shaheed .... We will either achieve freedom or will bring destruction for the whole of the country. Long live Pakhtunistan , Long live Afghanistan". Meetings of various tribes of Waziristan, Khattaks, Marwats, Bhittanis, Turis and Bannuchis were held on January 11, 12 and 15, 1950 for the election of Pakhtunistan National Assembly (Waziristan Branch) and its President. The Assembly thus elected unanimously decided to have the Faqir of Ipi as its first president. In that capacity the Faqir demanded the withdrawal of Pakistani forces from the Pakhtun territories to free the land of seven million Pakhtun, otherwise they will be themselves responsible for its consequences. He also appealed to the United Nations for recognition of Pakhtunistan and requested the Afghan authorities for its publicity. In August 1951, a special delegation consisting of Malik Abdullah Khan Mada Khel, Malik Atta Mohammad Khan, Malik Behram, Malik Jani and Malik Badshahi with a special message from the Faqir of Ipi visited Kabul and met with Muhammad Zahir Shah, the then King of Afghanistan, the late Sardar Daud khan and the ambassadors of India and Iran. In 1952 when Malik Wali Khan Kuki Khel , Malik Said Khan Zakha Khel and Maulvi Ghairat Gul of J.U.I called a Jirga of the Afridis , at Mamanri to take decisions about Pakhtunistan, Pakistan Air Force bombed the assembly which caused 18 casualties. After 3 days the house of Malik Wali Khan Kuki Khel was destroyed. In 1954, Christopher Rand, a correspondent of The New York was able to interview the Faqir of Ipi at Gurwek. Shortly afterwards, two Soviet officials, Messrs Alexovitch and Demrovitch, members of a Soviet technical mission at Kabul, called upon the Faqir of Ipi at his Gurwek headquarters. In 1952-53, the flow of money to Gurwek from Afghan Government was greatly reduced due to some misunderstanding between the Faqir and the Pakhtunistan leaders based in Kabul. However, through Faiz Mohammad, the Afghan Wali (Governor) of the Southern province, the subsidies were restored. The Faqir’s position was weakened when his close associate and principal lieutenant Khalifa Mehr Dil Khattak surrendered to Pakistani officials in Bannu (November 1954) along with seven followers. On March 27, 1955 the Pakistani Government promulgated the ordinance creating "One Unit" in West Pakistan. 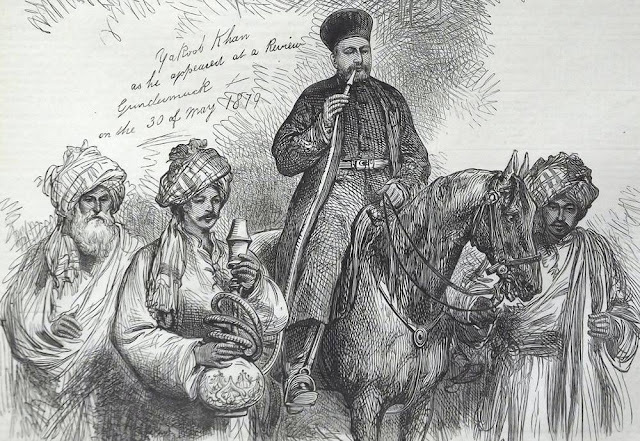 The Afghan Government considered it as a move to destroy the identity of the Eastern Pakhtuns. The reaction culminated in an inflammatory speech by Afghan Prime Minister, Sardar Daud Khan, on March 28. The next day, Afghan mobs sacked Pakistani diplomatic mission building at Jalalabad and Kandahar and the Pakistan Embassy at Kabul. A retaliatory attack was made few days later on the Afghan Consulate at Peshawar. Pakistan clamped a blockade on Afghan Imports and exports. A Mahsud jirga in South Waziristan during a meeting of Maliks, claiming to represent 10,000 North Waziristan tribesmen ostentatiously asked permission to march on Kabul to avenge the national honour. During the time between 1956 and 1958, the tension was eased as Iskandar Mirza, the then President of Pakistan, exchanged State visits with Muhammad Zahir Shah. It was reported in October 1958 that "the Faqir of Ipi who was the pivot of the so-called Pakhtunistan Movement..... has recently turned absolutely indifferent, if not openly hostile to Afghanistan, the reason being that the Afghans realized the futility of their monetary aid to him and stopped paying the tribes through him. He has discarded the so-called Pakhtunistan Flag and has hoisted instead his own flag which is called “Faqir Flag.” Maulvi Amir Saeed alias Jangi Mullah, and Maulvi Akbar Zaman Bannuchi, the close associates of the Faqir, distributed in the Hamzoni Dawar area the copies of newspaper "The Azad Pakhtun" published at Gurwek. The paper, inter alia, published the details of the Faqir’s tour in Wazirstan. "Amir-ul-Muslimeen (the Faqir) along with his lieutenants is on his tour to Waziristan. Presently his tour has good effects on the Bhittani tribe as well as on other tribes. A number of old disputes were settled among the Wazirs, Mahsuds and Bhittanis. A large number of weapons and cash was collected for the Faqir’s exchequer in the Mahsud territory". Though during his tour the Faqir remained silent about Pakistan, but he never turned pro-Pakistan. 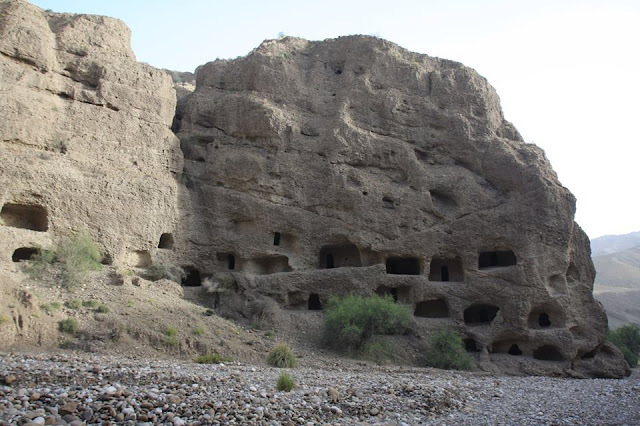 After his tour of Waziristan, he holed himself in a cliff-side cave at Gurwek, and on 16th April, 1960, he died of asthma. His funeral prayers were attended by thousands of people and his funeral prayers were led by Maulvi Pir Rehman. 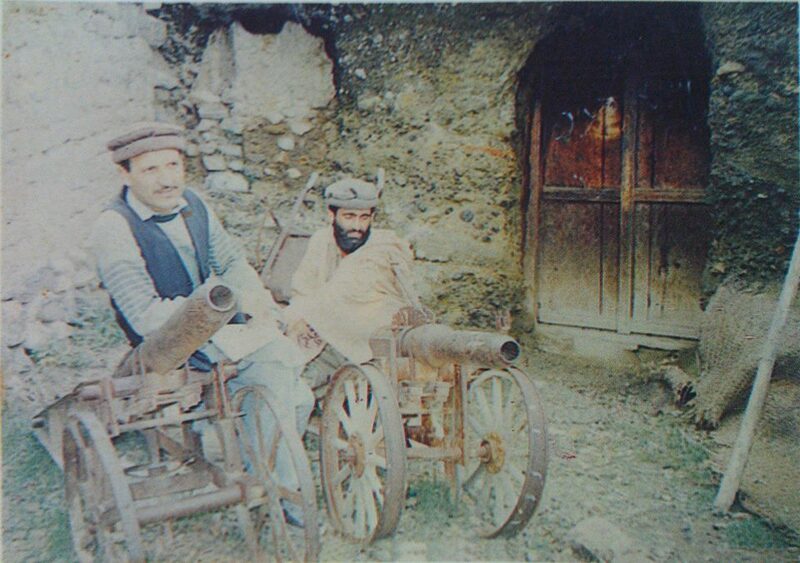 Faqir of Ipi's cannons at Gurwek (North Waziristan) used in Jihad against the British.